The bungalow in El Campello has 4 bedrooms and has capacity for 10 people. The bungalow is nice, is very light. It has views of the garden and the swimming pool. The property is located 180 m from TRANVIA TURISTICO , 300 m from PLAYA DEL AMERADOR sand beach, 3 km from EL CAMPELLO city, 3 km from VARIOS EN EL CAMPELLO supermarket, 8 km from BONALBA GOLF golf course, 28 km from AEROPUERTO DE ALICANTE airport. The house is situated in a family-friendly neighborhood next to the sea. The accommodation is equipped with the following items: garden, garden furniture, fenced garden, terrace, barbecue, fireplace, iron, internet (Wi-Fi), private swimming pool, open-air parking in the same building, 1 TV, tv satellite (Languages: Spanish, English, French, Russian). 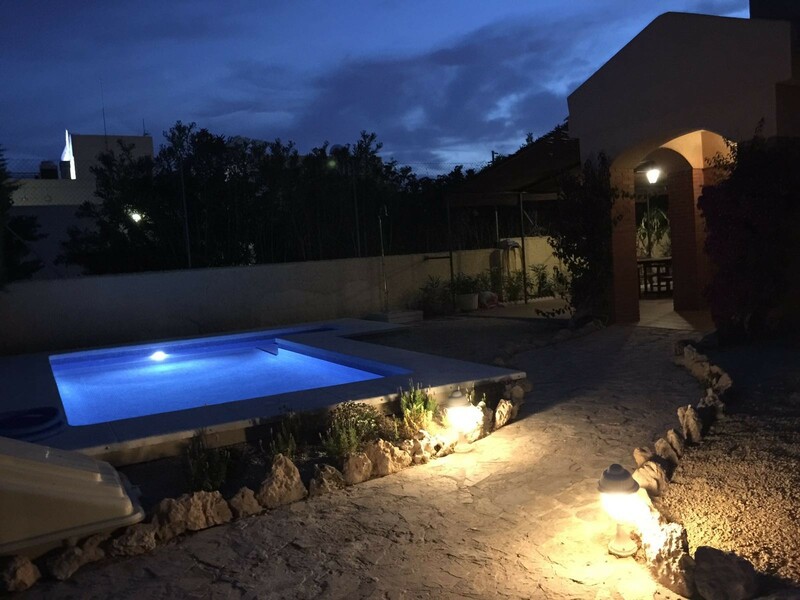 1 TV, TV Satellite (Languages: Spanish, English, French, Russian), garden, garden furniture, fenced garden, terrace, barbecue, fireplace, iron, internet (Wi-Fi), private swimming pool, Open-air parking in the same building. Amount: €400.00 /booking.Payment method: credit card, paypal, credit card hold.To be paid on site. Not enough stuff in the kitchen.